For one week each September, our campaign focuses on Include a Charity Week, a PR-focused activity to amplify and maximise our message. Aligned with international legacy weeks across Europe and in New Zealand, Include a Charity Week raises the profile of charitable gifts in Wills and provides an opportunity for supporter charities to convey their importance. The more people we get involved the bigger the movement this is going to be. By working together and concentrating our efforts into a specific week, we intend to demonstrate just how easy it is to include charitable gifts in Wills and help more people understand the huge impact these gifts have on the work that charities do. By highlighting the importance of this area of philanthropy and actively encouraging more people to think about supporting their favourite charities in this way, we will ensure their good work can continue into the future. Click here to read all about Include a Charity Week 2017. We had amazing results last year! A massive thank you to all our supporters! This year we brought in Dr. Claire Routley, UK legacy fundraising specialist and academic. 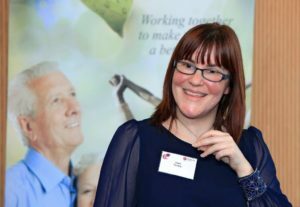 Dr Claire Routley has worked in fundraising for over fifteen years, specialising in legacy fundraising for the last decade. In 2011, she completed a PhD looking at why people choose to leave legacies to charity. She has worked for Bible Society, Age UK, WRVS and a local hospice, and is a tutor for the Institute of Fundraising’s qualification courses. She is now a fundraising consultant, and a research fellow at Plymouth University’s Hartsook Centre for Sustainable Philanthropy. She is also a member of fundraising think-tank Rogare’s international advisory panel, and was recently named AFP’s emerging scholar 2017.